BFI Southbank screened the hour-long BBC adaptation of Bertolt Brecht’s early play Baal a month or so before Christmas. Viewing this 1982 production on that occasion I marvelled that anything so bleak, austere and radical could possibly have been screened at 9.25pm on a Tuesday evening on BBC1. 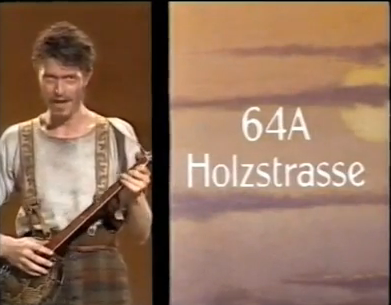 Billed and titled on the recording as David Bowie in Baal, the adaptation (which can be found in full on YouTube; see below) also has a newly topical sense this week with the news that the star will in March this year release The Next Day, his first studio album for a decade. For Richard Clarke’s oral biography of the filmmaker Alan Clarke, Barry Hanson, who produced several of Clarke’s films, recalled that the director ‘was obsessed by Brecht’ (Richard Kelly, ed., Alan Clarke, London: Faber and Faber, 1998, p. 137). The German playwright was most definitely an influence on Clarke’s musical film Billy the Kid and the Green Baize Vampire (1985), but Baal was the director’s only television adaptation of one of Brecht’s plays. Productions of Brecht’s plays on British television have in any case been comparatively rare. The first came after Brecht’s company the Berliner Ensemble brought Mother Courage and her Children to London in 1956. Rudolph Cartier then mounted the play for BBC Television in 1959 with Peggy Ashcroft in the lead role. A recording of this survives, but there is no trace of Ronald Eyre’s 1961 production for schools’ television at the BBC of Life of Galileo. The following year, Eyre made The Caucasian Chalk Circle, also for BBC Schools, and only one of its four episodes is extant. Peter Luke produced Life of Galileo for the BBC in 1964 and a year later Philip Saville directed The Rise and Fall of the City of Mahagonny; both of these BBC productions are extant. The Jewish Wife (a short play that is one scene of Brecht’s Fear and Misery in the Third Reich cycle) was produced by Hal Burton in a BBC series called A Touch of Venus in 1968 (this survives) and under the title of The Gangster Show director Jack Gold made a remarkable film of The Resistible Rise of Arturo Ui at the BBC in 1972. Bill Hays’ version of The Caucasian Chalk Circle made for Play of the Month in 1973 is lost, making it one of the most recent recordings of a major television stage to be missing from the archives. And Baal rounds out the corpus, with no Brecht adaptation having been made by television in the last thirty-one years. Willett has recalled that it was Alan Clarke’s interest in the German hard-edged painting of the 1920s known as Neue Sachlichkeit that initially led him to the 1926 version, which is also known as Lebenslauf des Mannen Baal (‘The Life and Times of a Man called Baal’). 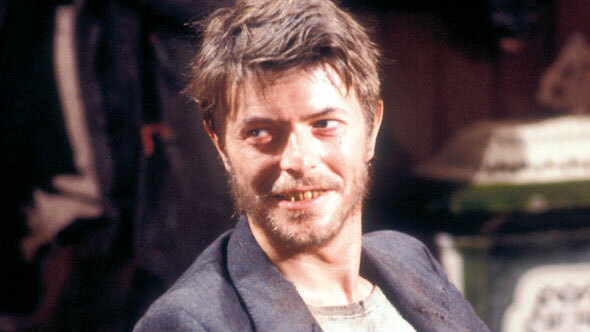 According to Willett, Alan Clarke’s first choice to play Baal was Steven Berkoff (‘I thought it was a mistake’), and he claims the credit for suggesting Bowie, who had been playing in The Elephant Man in New York and who had a strong interest in German Expressionist painters of the 1930s. Set in the years before the Great War, the minimal narrative is a succession of scenes in which the young poet alienates everyone he encounters, whether at a smart dinner party or in a low-life tavern. He sleeps with women, sings, drinks, abandons an unborn child, drinks, sings, and goes wandering in the mountains where he dies in a hut after the wood-cutters who live there have gone to work. There is little sense of character development but Baal is used largely as a foil to expose the hypocrises of society at all levels. Between the vignettes, Baal stares into the screen and sings, often in a split-screen shot which pairs him either with one of the other characters or with a caption. After Alan Clarke’s death in 1990, the producer David Jones reflected on the parallels between the director and Brecht’s anti-hero. David Bowie’s eclectic acting career is detailed in a discrete section of his Wikipedia entry. He was introduced to Brecht in the late 1960s by his mime teacher Lindsay Kemp, and he first appeared on stage in Kemp’s avant-garde dramas. After a number of smaller roles he took the lead in the 1976 film The Man who Fell to Earth, directed by Nic Roeg. By the time Baal was recorded, he was an experienced actor and he has a fresh, immediate quality that feels quite distinct from the naturalistic performances of most of the others in the cast. ‘He has a powerful presence,’ Nancy Banks-Smith wrote in the Guardian, ‘a voice sandpapered perfectly flat, and he made everyone else look as if they were acting’ (‘Banjo Bowie’, 3 March 1982, p. 11). In a preview feature in Radio Times, Henry Fenwick was similarly enthusiastic. Following the recording of the play in August 1981, Bowie and his producer Tony Visconti went into a studio in Berlin to record five songs composed for the television adaptation. Four were set to new compositions by composer Dominic Muldowney, with a fifth, ‘The Drowned Girl’, done to an original setting by Kurt Weill. An EP of the songs was issued by RCA Records to coincide with the BBC transmission on 2 March 1982. The full production can be found in an illegally uploaded copy on YouTube, which I reference only because there is no other way to access on any kind of regular basis this remarkable production. The most noticeable characteristic of the drama on the screen is the extraordinary sense of side-to-side movement that the cameras achieve. John Willett remembered the way in which the production set-up defined this. The action of the interiors moves back-and-forth along a plane parallel to the screen. Early on, a waiter walks a remarkable distance in one direction and then turns and walks back along the same line, all within the same room. The space of television drama is almost invariably far more constrained, but by shooting from a distance and working with long lenses, Clarke achieves an effect that feels almost frieze-like. Certainly, Baal is not easy or particularly engaging watch. But – as with most of Alan Clarke’s work – it is a powerful and innovative production that uses the television studio in ways no one else is capable of and that thirty years on looks like a bold and uncompromising adaptation of a major playwright with at its centre a performance by one of the defining cultural figures of our time. Let me end with an intriguing footnote. In the edition of The Listener dated 25 February 1982 there is the promise of a preview of Baal by the critic John Elsom. 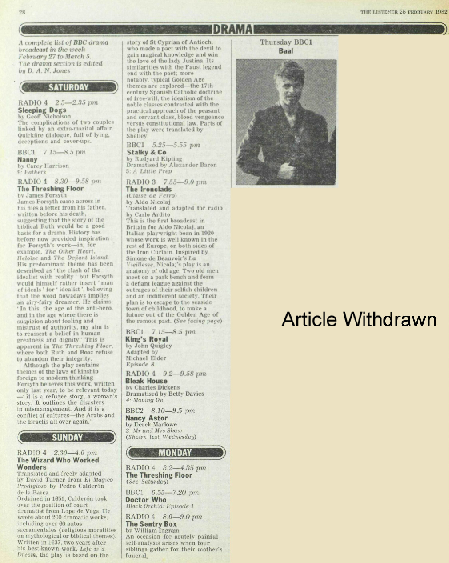 On p. 28 there is a headline, ‘Bowie in Brecht’ but – in the online version of the magazine published by Cengage Learning – the piece has been neatly excised and the words ‘Article withdrawn’ inserted. What on earth could have been published there that could not be repeated in the digital version? I shall investigate in a printed copy in the archives. The 1973 Caucasian Chalk Circle appears to have been used fairly often as an educational resource in the 1970s and early 1980s. 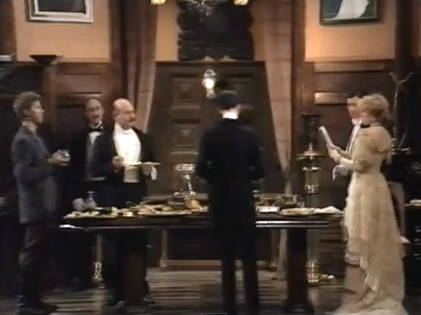 As recently as 1990, I was shown a fuzzy second or third generation VHS copy in an A-Level drama lesson – had I known at the time that I was watching perhaps the sole surviving print of this programme, then I might have watched more attentively! Many thanks, Billy – I feel dumb that I had not read your excellent post before writing this; I have acknowledged its strength in an ‘Update’ note included above. can I not get this production on DVD?